As shown, the Cluster Manager consists of two processes. 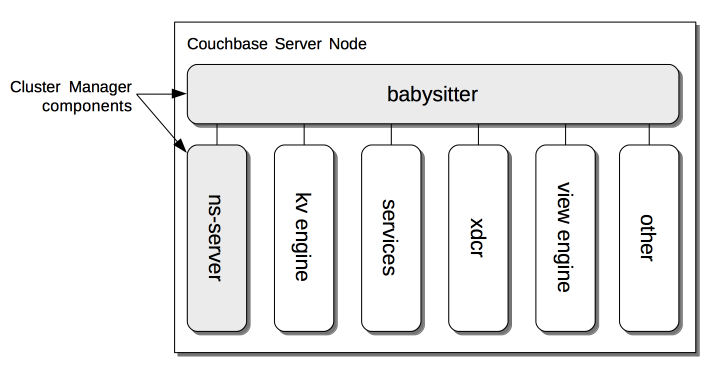 The first, the babysitter, is responsible for maintaining a variety of Couchbase Server-processes, which indeed include the second Cluster Manager process, ns-server. The babysitter starts and monitors all of these processes, logging their output to the file babysitter.log (see Manage Logging, for information on logfile-locations). If any of the processes dies, the babysitter restarts it. The babysitter is not cluster-aware. For the practical steps to be following in adding and removing nodes, see Add a Node and Rebalance and Remove a Node and Rebalance. For detailed information on failover options, see Fail a Node over and Rebalance. Statistics are accessible through all the Couchbase administration interfaces: The CLI, the REST API, and Couchbase Web Console. See Management Tools.